This is following Fayemi’s allegation that Fayose and some INEC officials are printing fake election forms in the Ekiti Government House. 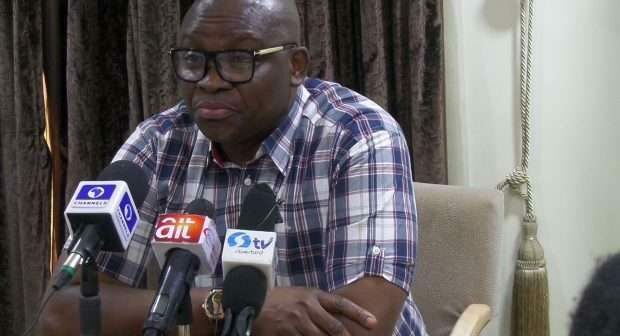 Governor Ayo Fayose has alleged that the All Progressives Congress (APC) governorship candidate has hired four officials of the Independent National Electoral Commission (INEC) to manipulate the results of the Ekiti governorship election, slated to hold on July 14, 2018. Daily Post reports that Fayose said this during a state wide broadcast on Saturday, June 30, 2018. He said the officials are: Pasca Ukenwa, Deputy Director, ICT, Abdulrasak Agboola, Deputy Director, ICT, Kenneth Ukeagu, Procurement Officer, and INEC Commissioner, Amina Zakari. “I am still raising the alarm again of the plan of three Abuja senior officials of the Independent National Electoral Commission (INEC); Pasca Ukenwa, Deputy Director, ICT, Abdulrasak Agboola, also Deputy Director, ICT, and Kenneth Ukeagu, Procurement Officer of INEC, they are working with Fayemi in a desperate plan to rig the July 14 governorship poll in Ekiti. Ukaegu is planning to get ballot papers for Fayemi while the ICT directors are planning to reload card readers for Fayemi. “Ukeagu is assuring Fayemi that if he can reload the card readers, he would get the ballot papers for them. The three INEC officers are all working with Amina Zakari, another big shot of INEC in Abuja. Zakari was the one Anambra rejected with a claim that she would rig the last Anambra election in the state. Zakari is a professional rigger and I have no apology for that statement. “All the APC plans to do is to rig the election but we will reject that. They got into power at the federal level because the process was transparent. I have told INEC not to rig for me because the people of Ekiti are solidly behind our candidate. “We know all about the plans of APC and all the movements of everyone working with him to manipulate the electoral process. Part of their plan to stuff their pockets with ballot papers when coming to vote. I urge Ekiti people, don’t go away once you have voted, stay with your votes. They have also brought thugs in all the hotels, but we know where they are and they can’t do anything,” he said. 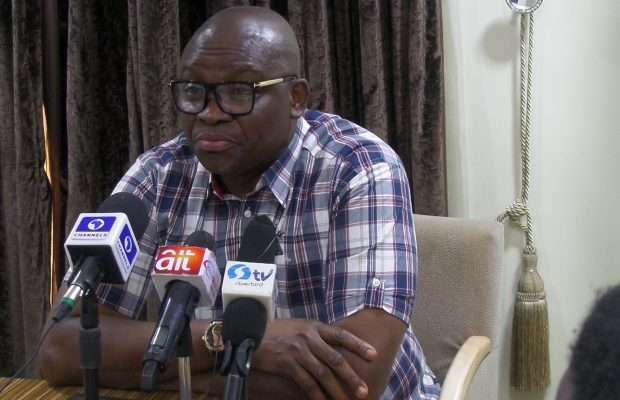 According to Fayose, the Federal Government has also refused to release Ekiti state’s monthly allocation so that workers in the state will turn against his government. “The Federal Government has refused to share the allocation. They decided to delay so that workers in Ekiti would be angry with Fayose. They held a meeting last week Saturday and decided to delay the allocation so that workers won’t get salaries until after July 14 poll. They are owing me two budget support. “They delayed the salaries of the workers across the nation because of Ekiti. Is that a government that loves the masses?” The governor also took a critical swipe at Fayemi, alleging that the state has not benefited anything from the ex-minister’s appointment into the federal government cabinet. “If Fayemi were to be governor he wouldn’t have been able to fight against Fulani herdsmen in Ekiti the way I had done because he would be afraid of Buhari. “Tinubu said Fayemi is Buhari’s friend but is Bubari coming to rule Ekiti? A Buhari’s friend cannot tackle herdsmen menace because Buhari’s himself has failed to deal with the challenge at the national level. “For Fayemi to have condemned the success of our students in NECO exams is bad. He said that our children who came tops in exams had had their exam answers bought for them is appalling and an height of reckless statement. “Fayemi is coming with bitterness to come and devour and destroy all of you. I know what I am saying. I have served you before and I am still serving you and you can know the difference. “The power of the people is greater than those of us in power, peoples’ might is greater than federal might. Anything that does not represent the truth in this poll will fail. “The opposition are fighting God and they will fail. We will beat APC 16 :0 again. There will be a mother of all rallies on Thursday, July, 5 where the PDP flag will be given to our candidate, Olusola Kolapo Eleka. There will also be victory walk where all of us will wear white, and walk through the state capital praising God and thanking him for victory over our enemies,” he added.